Melton Classics is pleased to announce the introduction of its architecturally correct line of FiberFlute Classic™ fluted fiberglass columns. 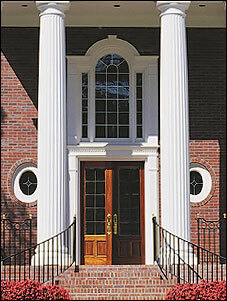 These durable classically proportioned columns are created with full depth ionic flutes to create the elegant vertical shadowing effects which have enhanced the beauty of fine architecture for centuries. FiberFlute Classic™ columns are load bearing, but can be provided manufactured halves for reassembly around structural supports. Columns manufactured in halves are provided with an overlapping joint detail to facilitate realignment and rejoining of the column halves. Backed by a limited lifetime warranty, FiberFlute Classic™ columns are simple to install, and can be specified for Class 1 fire rating upon request. 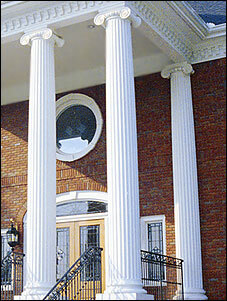 FiberFlute Classic™ columns are currently available in many popular classical designs from 14″ to 36″ in diameter. Contact your Melton Classics Architectural Products Representative at 800-963-3060 for pricing and availability of your desired size and design. DIAMETER 14" 16" 18" 20" 24" 30" 36"